Stephen Donnelly joins Fianna Fail. FIANNA FÁIL NEWCOMER Stephen Donnelly has said he has been “eviscerated” online after announcing he was joining the party last week. 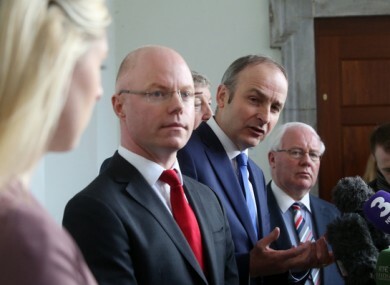 Flanked by Fiánna Fáil leader Micheál Martin last Thursday, the former independent TD announced to the media that he had received overwhelming support from his constituents. For months he said his constituents had been encouraging him to join a party – and he thought Fianna Fáil – a party he actively criticised in the past – was the best political fit. However, speaking to Pat Kenny on Newstalk radio, the Wicklow TD said some of the reactions were “quite unpleasant”. I’m acutely aware of the hurt some people are feeling, and want to acknowledge that. Close to 300 people left comments on the post – and many were highly critical of the TD’s decision to jump ship. There were also over 336 emojis left on the post. Emojis left under Stephen Donnelly's Facebook post. Stephen you were not elected by the people of Wicklow and East Carlow as a FF TD. If I had wanted to I could have voted FF but I didn’t and I won’t be voting for you again. The decision was not yours to make that is an electorate decision! You should have resigned your seat and stood for election as a Fianna Fáil candidate in the by-election. The guy took a hugely unpopular decision, puts the safest seat in the country at risk, along with his integrity and you all deride him for being ambitious? Would people prefer an unmotivated politician, who’s happy to sit around on a cushy public salary without ever achieving anything? This was a point that Donnelly made to TheJournal.ie last week, when it was pointed out to Donnelly that he was primarily elected on the basis that he was not a member of Fianna Fáil or Fine Gael and went so far as blaming the party he joins today for the economic crash in 2008. Which would you prefer – would you like me to sit nice and safely on the independent benches advocating for change on the side or would you prefer me to be working with a strong team as a Fianna Fáil TD to basically try and shift this county in the right direction – and pretty much all of them [his constituents] have said yes, we would prefer you working with Fianna Fáil in the Fianna Fáil team. I took what could be described as a deeply unpopular decision with a lot of people… To those who I have genuinely hurt. I apologise for that. However, he said he knew that making a “deeply unpopular decision” (to some people) would garner the reaction online and on social media. Email “Donnelly says he was "eviscerated" online after joining Fianna Fáil ”. Feedback on “Donnelly says he was "eviscerated" online after joining Fianna Fáil ”.